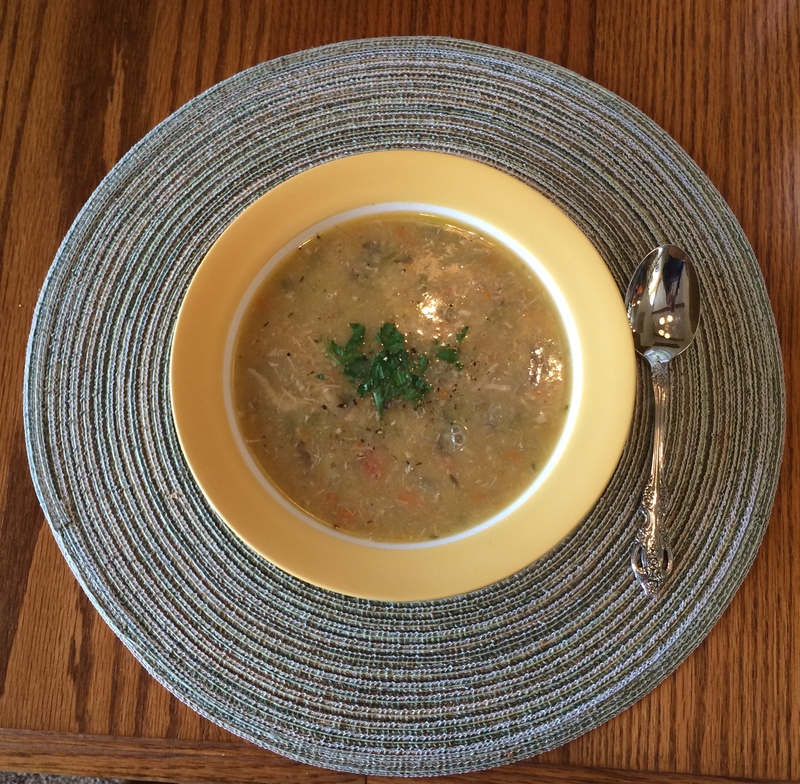 Creamy EZ Chicken Soup – Healthy, EZ, Yummy! Creamy Chicken is not only a yummy soup, it’s a great base for lots of hearty and healthy dishes. 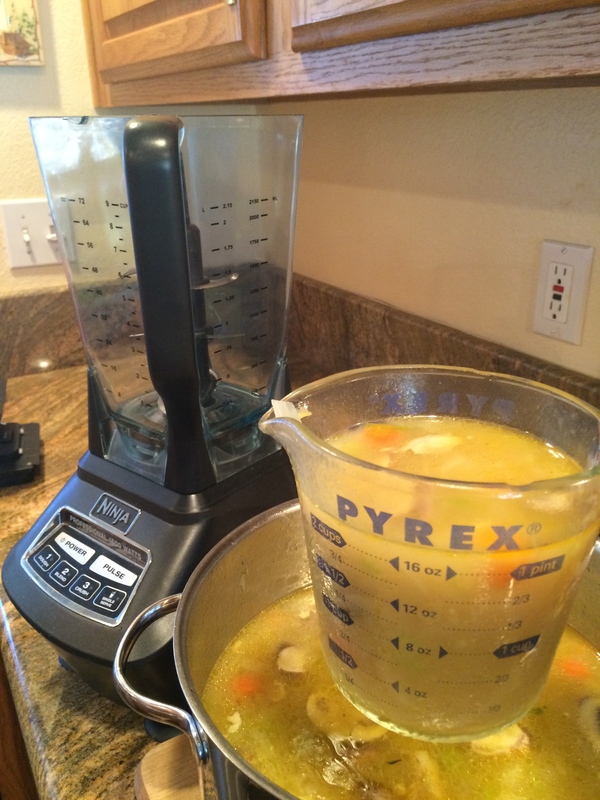 This updated recipe is even easier than the one I had posted previously. 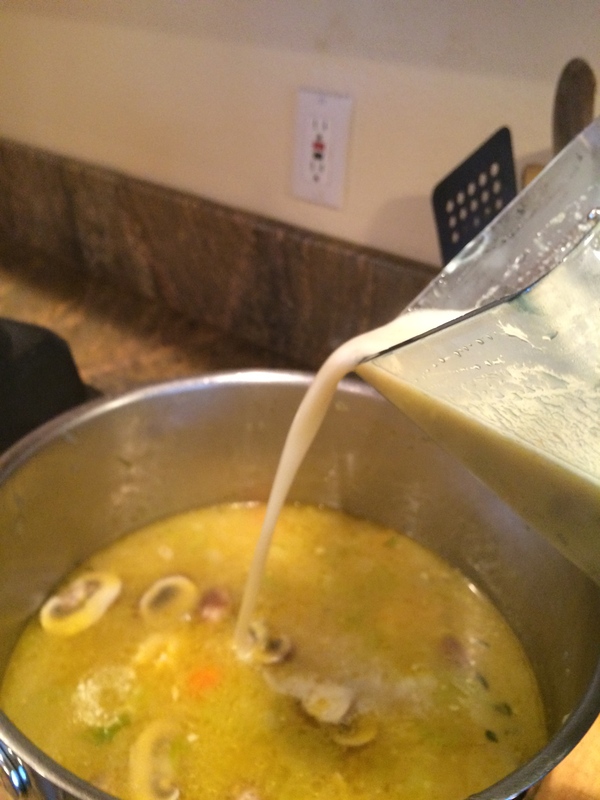 When you want homemade soup and you don’t want it to take all day, try this out! For the base of this soup, I hope you will try the no salt chicken stock recipe on this blog (I always have some in my freezer), but in a pinch you can always use the low sodium chicken stock in the store (Swanson’s is my fave, though I had to stop using it due to the high potassium). To further speed things up, this soup uses cooked (perhaps leftover?) chicken and Campbell’s Chicken Gravy. I know … canned gravy? But I scrutinized the Campbell’s ingredients and feel pretty good about them. I would not use any other canned gravy (try reading the labels – gross). You can substitute homemade gravy (if you’re lucky enough to have some on hand). If you don’t have any homemade gravy and you are unconvinced that Campbell’s is acceptable, you can leave the gravy out, but you will need to add your favorite seasonings to bring out the flavor. But hopefully you will give this recipe as written a try. It’s adapted it from a more complicated (and a lot less healthy) recipe on foodnetwork.com. This version is low fat and low salt. Melt the butter in a large soup pot over medium heat. 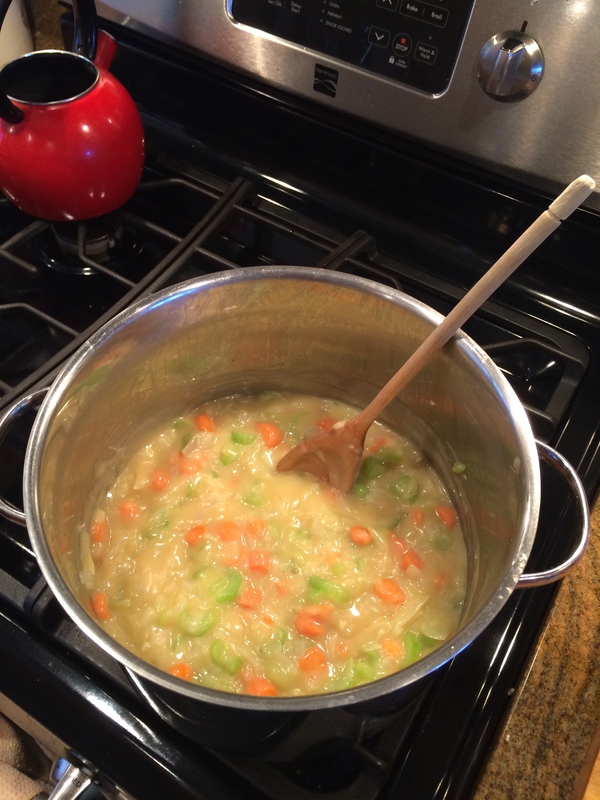 Add the onion, garlic, celery, and carrots and cook, stirring occasionally, until soft, about 10 minutes. Sprinkle the flour (I use wheat flour) over vegetables and stir until completely coated. Reduce heat to medium low and slowly stir in two cups of stock/broth, 1/4 cup at a time, stirring occassionally until mixture thickens and bubbles, about 3 or 4 minutes. Raise heat slightly and slowly stir in remaining 4 cups of broth. Add mushrooms and return to simmer (raise heat a little if needed) and stir occassionally until it thickens slightly, about 5 minutes. Pour about a third of mixture into a blender or food processor, and blend until smooth; pour blended mixture back into soup. 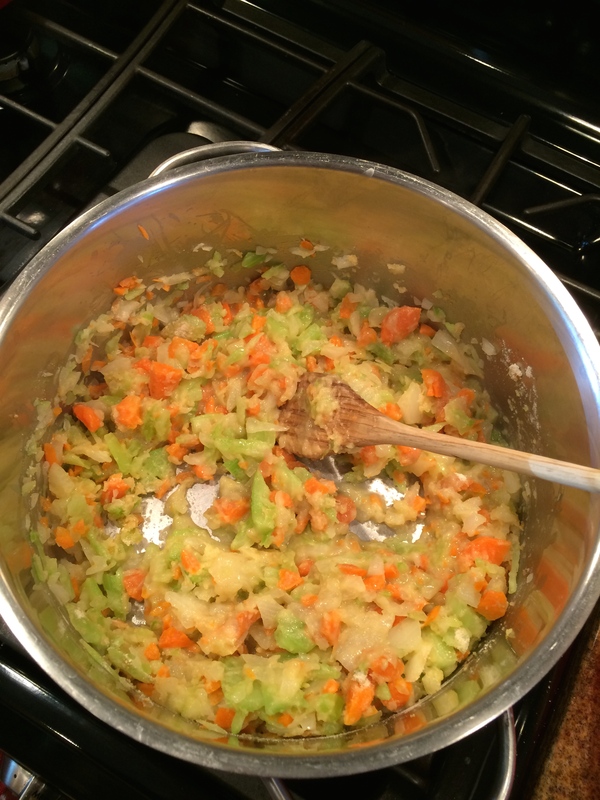 Pour in the gravy and stir well until gravy is dissolved into the broth. Add chopped chicken, parsley, thyme, poultry seasoning, onion and garlic powder and the half teaspoon cracked pepper. Lower the heat and simmer for 15 minutes. Remove from the heat. Add black pepper and salt, if needed, to taste. 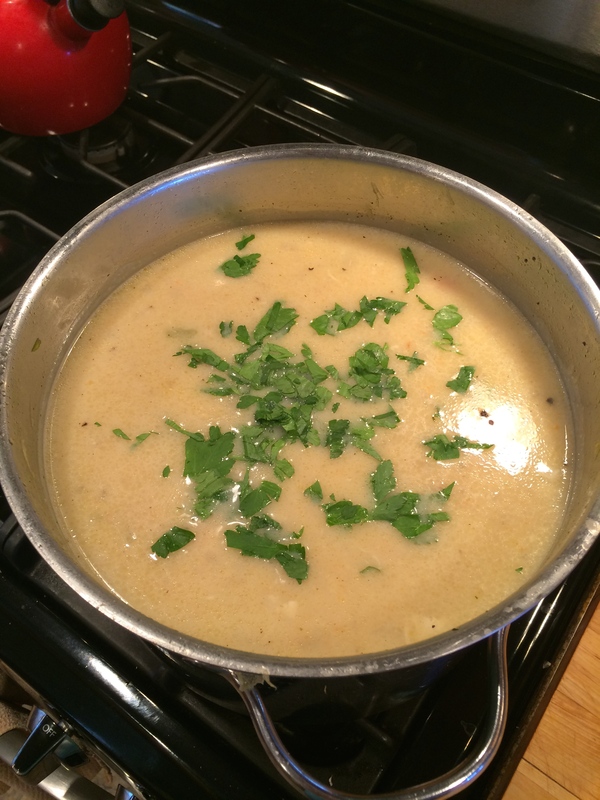 Divide among soup bowls, sprinkle the top of each soup with the chopped parsley; serve immediately.